After spending nearly ten years unloading trucks and counting boxes while moonlighting as a punk rock road warrior, Jason now spends his time as husband, father, pastor, and gamer. While listening to stories of his wife's exploits into the land of Catan during her college years, he was sure he'd married a huge nerd. Little did he know, that soon his love for interesting people and social interaction would lend itself so perfectly to the world of hobby gaming. 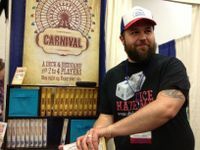 A few years and couple hundred games later, Jason designed his first game,"The Great Heartland Hauling Co.".